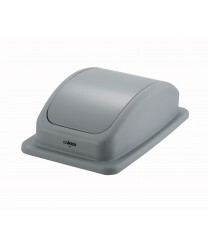 Built specifically for use with slimmer garbage receptacles, the Winco PTCL-23 Gray Cover for Trash Can Winco PTC-23SG will help your commercial kitchen run more efficiently. This gray trash can cover has a swing-door design and is made of durable plastic that washes up easily and tolerates long-term heavy-duty use. The matching can is sold separately as the Winco PTC-23SG, which has a slim, space-saving design.